The wheels of justice are spinning in the Anna Nicole Smith drug case. Yesterday it was announced that Howard K. Stern and two doctors were charged with several drug-related offenses. It’s about friggin’ time if you ask me. Howard K. Stern turned himself in last night — he was arrested and charged, along with two other doctors, for allegedly conspiring to fuel an addict with prescription drugs — and the addict was Anna Nicole Smith. Stern and Dr. Sandeep Kapoor and Khristine Eroshevich are being charged with a total of eight felonies. According to the L.A. County D.A., the conspiracy counts allege the three defendants conspired to furnish controlled substances to Smith between July, 2004 and January 2007. Stern and Kapoor were charged with one count of unlawfully prescribing a controlled substance. Eroshevich and Stern were charged with unlawfully prescribing a controlled substance between June 2004 and January 2007. Kapoor and Eroshevich were each charged with obtaining a prescription for opiates by “fraud, deceit or misrepresentation.” They were both also charged with one count of obtaining a prescription for opiates by giving a false name or address. Kapoor and Stern were also charged with one count of “prescribing, administering or dispensing a controlled substance to an addict.” Eroshevich was charged with the same crime for separate prescriptions. Bail is recommended at $20,000 for each defendant. We know both Stern and Kapoor bailed out Thursday night. 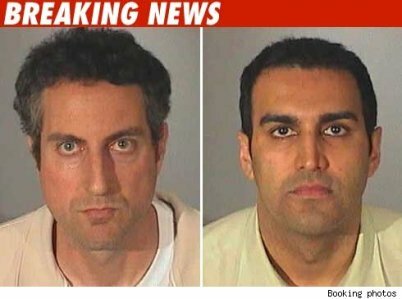 As we first reported, California drug officials recently raided the Los Angeles office of Dr. Sandeep Kapoor, looking for evidence against Stern. Stern has denied doing anything illegal in connection with drugs and Anna Nicole. Well of course he’s denying it. That’s what creeps do! Sam Lutfi denies he drugged Britney Spears, but we’re all pretty convinced he did. Oh hey, I wonder if the law will finally go after Lutfi and Adnan Ghalib (who, by the way, is facing deportation) for all the damage they did to Britney Spears. She didn’t die from the abuse like Anna Nicole Smith did, but got pretty darn close.